The folks at Verizon (s vz) are excited about the first tablet handled by the carrier, and sent over the Samsung Galaxy Tab for me to give a spin. It’s only been here a few hours, and while I will do a full review I can share my first impressions to hold you over. 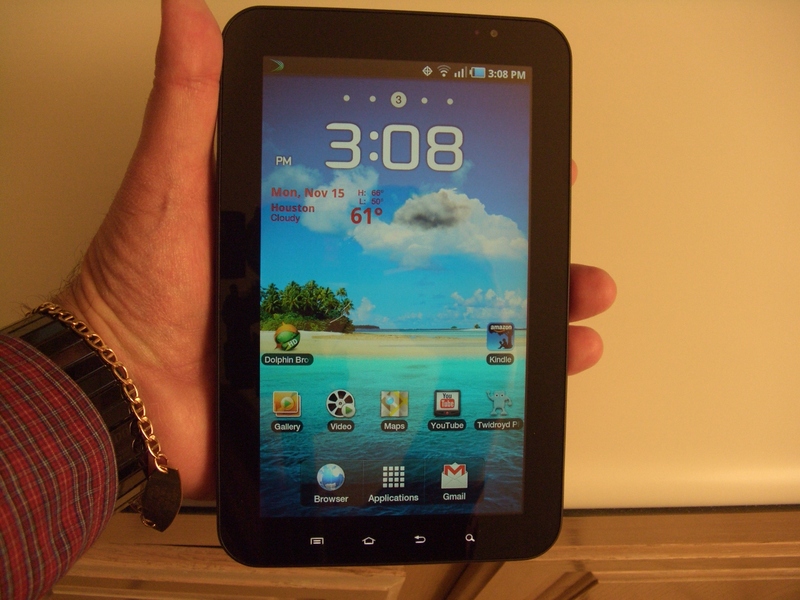 The Galaxy Tab is a 7-inch tablet that’s thinner and much lighter than the iPad (s aapl). I’ve read on the web that the Tab is just a Galaxy S smartphone grown bigger. I’ve tested Samsung’s smartphones, and find the Tab is exactly as described, and that’s a good thing. The Tab doesn’t have voice call capability in the U.S., but I don’t miss it, as I find it to be a companion device to my smartphone. Think of all the cool web activities you can do on an Android (s goog) phone, and those are the functions that the Tab does better given the nice big screen. Samsung has done a good job adapting the productivity apps (contacts, calendar, email) to the Tab’s larger screen, and they work much like those on the iPad. In the narrower portrait orientation, there’s a single pane display, but when rotated into landscape the display changes into two panes. Unfortunately ,the email app doesn’t work with Google Apps accounts, requiring the use of the standard Gmail app, which is single pane only. The build quality is solid and feels very sturdy in the hand. The Tab is heavier than I expected, but I’m getting used to the weight with use. Screen is beautiful, and very responsive to touch. Makes a fantastic e-book reader with the 7-inch screen (Kindle (s amzn) app pre-installed). The Twidroyd Pro app in the Android Market is fantastic on the Tab with two panes. All my core Android smartphone apps work well on the bigger Tab screen. Harder to hold than I expected; bezel is small and hands can cover the screen inadvertently. Charging cable included is only 3 feet which limits where the device can be charged. Proprietary connection limits use of standard USB cables. Web browser can be a bit laggy at times. Dolphin Browser in the Android Market is great, though. This is just a rushed account of my initial impressions. I already like using the Galaxy Tab, and haven’t encountered any deal-breakers yet. Think of the online activities you do on an Android phone that would be even better on a larger screen, and you have the primary usage scenario for the Galaxy Tab. When will HTC, Sumsung and the likes understand what Dell got but couldn’t deliver well … we all crave for a 4.8″-5.5″ device. That is as big as the hand can hold and its a whole new experience for a smartphone. 7″ can not be your everyday companion. But its a nice competition for iJobs. Great review hope to see a video of this soon. So they don’t have a kick stand, suppose I will have to get one from Groovystand. I’m not sold that tablets are must-have devices yet, but the first gen of devices look to be heading in the right direction. That proprietary power connector is a major deal-breaker for me – I don’t see why a simple barrel connector wouldn’t do, with a mini-USB port for syncing. It would enable use of external batteries like the Energizer XP8000 for charging on the go. and what’s worse — it won’t charge from a computer USB port, even using the Samsung cable. This was a bad decision by the Samsung designers. Even so, it’s a great device and I would not give it up! perfect example, when browsing does the extra resolution allow you to see more content? easy way to do this is just go to the same webpage & scroll to the top. obviously on Windows machine you would be able to see more (all settings being equal) but does Android properly scale as well? How is battery life ? This was my first day of use at work. I had it running at least half of the day, checking email, writing notes, etc. with WiFi running and screen on bright. I have been using it at home most of the evening. I still have 40% charge. I would estimate (based on weekend usage) at least 5 hours continuous heavy usage (everything maxed out). Battery life is about double my Nexus One with similar usage. I have been using mine since last Friday and love it (mostly). It is a shame that Samsung did not at least use a standard PDMI cable (as early reports suggested). The connector is definitely NOT PDMI. I mostly miss getting Google voice transcribed messages on the device (a needless omission). To Ainkor: use TouchDown for Exchange support (you won’t be sorry). It’s not at all obvious, but you CAN receive Google Voice messages from your Verizon Galaxy tab. In comparison to an iPad, how is it? My biggest frustration with Android is the whole typing experience. I can type incredibly fast on my iPhone and my iPad but forget about it on my Droid 2. The software just doesn’t seem as fluid in this area. Also, it may be a minor question, but how is the exchange support? The built in exchange mail app for Froyo doesn’t support HTML email from an exchange 2003 server, but surprisingly the Droid 2 one does. This would actually be the biggest deal breaker for me. I am really impressed with the reception of my Verizon Tab. It get’s 3G and WiFi reception in areas of my house that I never had before. I would assume it’s the size of the antenna and the plastic case. I’ve only had it since Thursday but I definitely love it as a third device, along with my DroidX and a Lenevo X100e netbook. The nice part with the Tab is I can do serious work on my netbook, but basically use the Tab as a second view screen of all my email, files, etc. Same with the DroidX. I can thumb type extremely well on the DroidX so I can reply to emails with that, while using the Tab to view all my support materials.